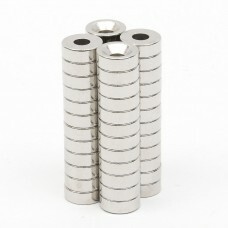 Rare-Earth N35 Strong Magnets (5 Magnets pack).Width: 5MMLength: 5MMHighet: 5MMPack include: 5 Magne..
Rare Earth Neodymium N50 Disk Ring Hole Shape (5 magnets pack)Radius: 6mmHeight: 3MMPack i..
Rare-Earth Neodymium N50 Strong Magnets. Rectangle Shape (5 Magnets pack).Width: 5MMLength:&nbs..
Rare Earth Neodymium N50 Rectangle Shape Hole Magnet (2 magnets pack)Width: 10MMLength: 20..
Rare-Earth Neodymium N50 Strong Magnets. Square Shape (2 Magnets pack).Width: 20MMLe..
Rare Earth Neodymium Magnet N52 Disk Ring Hole Shape (5 magnets pack)Radius: 8mmHole size: ..